Caretaker manager Ole Gunnar Solskjaer, who has overseen a dramatic return to form for Paul Pogba has said the World Cup winner has the qualities to be captain of Manchester United. The France midfielder was told in September by then-manager Jose Mourinho that he would never captain the club again, days after an apparent disagreement over tactics. Mourinho denied at the time that there had been any fallout between the pair, having taken the decision to strip Pogba of his role as United vice-captain. The decision was made public days after Pogba appeared to question Mourinho’s approach by telling reporters that United should “attack, attack, attack”. Pogba, who performed erratically for his club over the first half of the season, has scored five goals in six appearances since Solskjaer arrived as interim boss on December 19. The Frenchman made his debut for United’s reserve team when Solskjaer was their manager during the 25-year-old’s first spell at the club. The Norwegian said that he has long believed Pogba has what it takes to lead a team, although made clear that he is happy with United’s current set-up, with Ashley Young the regular captain on the pitch while Antonio Valencia, who has made just eight appearances this season, is the club captain. “I know the boy from before, and he’s a leader,” Solskjaer said ahead of his team’s FA Cup fourth-round match against Arsenal on Friday. “He’s a character who influences people. He cares and wants to be successful. “He knows he can’t do it by himself. It’s a team game and he’s a character who brings so many good things with him when he’s enjoying himself, I have to say. “You see the personality. He loves playing football. He’s a larger-than-life character. That’s just the way he is. Solskjaer, though, says he is not worried about the way that players such as Pogba and teammate Jesse Lingard use social media. “It’s part of the era we live in,” he said. “That’s just society now, that’s what they’re used to, the kids now. I’m not, but they are. Solskjaer said that there were no immediate plans to give Pogba the captain’s armband, adding that he felt the role could sometimes be given too much significance. “Ashley’s wearing the armband, yes because Antonio’s struggled with fitness as well, in and out,” said Solskjaer. Happenings In the world of Sports today! Jurgen Klopp discard pressure claim despite goal drought. I’ve always wondered, Why do billionaires buy media empires? Although the financial situation for newspapers remains less than ideal, billionaires continue to invest in print media for their institutional worth, with aims to make publications self-sufficient. If you had $190 million to spare, what would you spend it on? If you’re Marc and Lynne Benioff, you’d buy a media empire. The flamboyant CEO of Salesforce and his wife purchased the publication from Meredith Corporation a few weeks ago, quickly distancing themselves from the magazine’s editorial direction. It was a decision that was made, Marc admits, without much forethought, and its spontaneity is as much a product of his outsized personality as it is of his wealth. Indeed, the large cash infusion represents a boon for Time, but represents only around three per cent of the Benioff’s net wealth. It’s endemic of a larger trend in business of high-earning CEOs bankrolling print media to insulate cultural institutions from economic and technological changes. While many are grateful for Benioff’s financial infusion, others are suspicious of his motives and the pressures he might exert on the newspaper’s editorial position. For his part, Benioff has moved to assuage those concerns, with Time’s chief content officer Alan Murray saying the Benioffs were willing to “put journalistic integrity ahead of corporate gains”. Otherwise, Benioff’s purchase of Time appears to be an effort to preserve the periodical, as opposed to turning it into a vehicle for his political views. That hasn’t comforted some sceptics though, who have witnessed the financially precarious situation that arises when business leaders expect returns on their investments. Why would anybody buy a newsroom? It’s easy to compare billionaires with an interest in media empires to Charles Foster Kane, Orson Welles’ ruthless newspaper magnate. The truth is often more complex than that. Some CEOs, like Jeff Bezos, purchase flagging institutions not out of pity but out of a profit motive. Bezos, after all, was initially unmoved at the prospect of purchasing a business that haemorrhaged money and that he didn’t know much about. Nowadays, The Washington Post is profitable, thanks to Bezos’ technological direction as much as his financial contributions. He has remained outside the newsroom, and has instead focused on the newspapers’ economic situation, preferring not to think of his contribution as a “philanthropic endeavour”. A comparable situation arose for Laurene Powell Jobs, when her Emerson Collective purchased The Atlantic in July 2017, saying that “there’s a door between Emerson and the Atlantic, but it only swings from the Atlantic into Emerson; it doesn’t open in the other direction”. Like Bezos’ approach, the emphasis wasn’t on editorial direction as much as it was on improving the economic function of the publication itself, which Jobs managed to do. Although the financial situation for newspapers remains less than ideal, billionaires continue to invest in print media for their institutional worth – an often-achievable goal, as newspapers are relatively inexpensive investments – with aims to make the publications self-sufficient. Do things always work out? In contrast to those two particularly fortunate cases, other entrepreneurs aren’t quite as committed to the outcomes of their chosen publication, quickly losing patience with their investment and becoming eager to rid themselves of it. Perhaps the most notorious example of this is Joe Ricketts, whose purchase of Gothamist prefaced an attempt to merge the idiosyncratic vehicle for snark and culture with his own New York-centric outlet, DNAInfo. The arrangement lasted for only eight months, in which time both newsrooms complained about mismatched agendas. When the staff of both publications attempted to unionise, Ricketts simply shut both down and walked away from the situation. Similarly, Peter Barbey purchased The Village Voice in 2015 promising that he was “flat-out serious about getting The Voice to be a major Manhattan publication”. Three years later, he unceremoniously shut down printing, citing “business realities”. Such billionaire investments in newspapers are met with suspicion by the journalists who work for them not because they portend maleficent editorial direction, but because they often become more accountable to the economic concerns of one person. Much like any other business, if there isn’t a model for self-sufficiency to work towards, that often means that the end is in sight. Much like any other business, if there isn’t a model for self-sufficiency to work towards, that often means that the end is in sight. In conversation with CNBC, Joshua Benton, director of Nieman Journalism Lab at Harvard, cited several reasons for why billionaires choose to become involved in media, including “a mixture of … sincere appreciation of the art form, … a desire to see it flourish … [!and!] a sense of civic responsibility”. Moreover, the chance for growth in an industry that has struggled to adapt to digital distribution is immense and has proven profitable under the right leadership. Ultimately, the emphasis isn’t about establishing a vehicle for personal retribution. It’s about product differentiation and, eventually, financial returns. 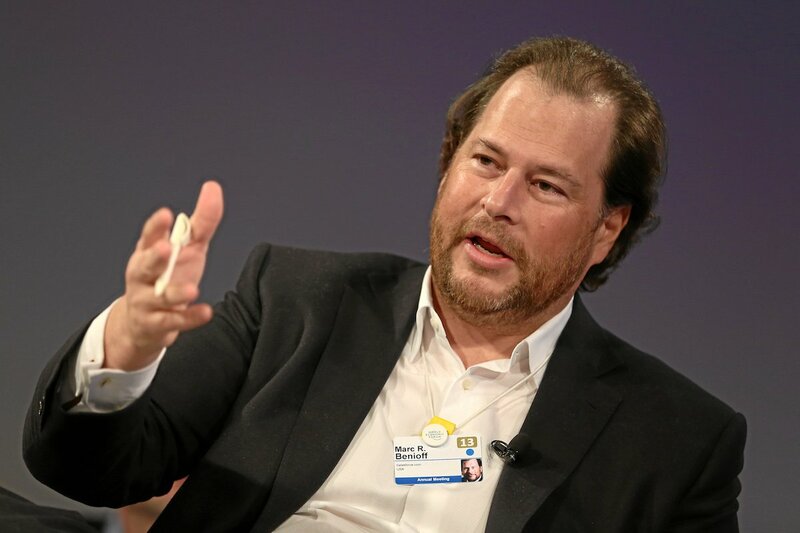 It’s not difficult to appreciate how Benioff views the matter; he believes that there are two types of CEOs, those committed to improving the state of the world, and those who are not. When he purchased Time, he was acting on that impulse, believing that print journalism deserved attention. It doesn’t mean he’s prepared to throw away a significant sum of money. It means that he’s willing to help a beleaguered industry through challenging times, with the sort of leadership and business expertise only an eccentric, carefree CEO can bring.